The day the Academy Award nominations were announced this year, Paul Giamatti was nominated for best supporting actor as a boxing manager in "Cinderella Man." Shortly thereafter Jess Cagle, entertainment contributor for The Early Show, said, "I think this year the Screen Actors Guild and the Oscar people are going to work together to kind of make up for the fact that he was shut out for 'Sideways' last year." And there you have the common wisdom surrounding Giamatti's nomination. But it's not the whole story. This is an actor whose face is like wallpaper. He looks so familiar that audiences frequently didn't really see him. But that's a big part of Giamatti's art; he weaves himself into the fabric of any story that's unfolding on the screen. 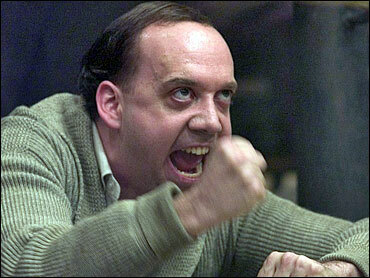 See photo essay for more pictures of Paul Giamatti. See Oscar Scorecard to see how Giamatti is doing compared to the other nominated actors. If you saw the Howard Stern biopic "Private Parts" (1997), you might have gone to see the shock jock on the big screen, but you surely came away wondering about the guy who played Stern's obnoxious boss. (It was Giamatti.) And, the following year, his was the familiar face in "The Truman Show" and "Saving Private Ryan." He also played a creepy orangutan named Limbo in the 2001 remake of "Planet of the Apes." His father was A. Paul Giamatti, a scholar (former Yale president) and sports executive (former commissioner of Major League Baseball). Not surprisingly, Yale is Paul Giamatti's alma mater. Giamatti, 38, and his wife, Elizabeth, have been married for eight years. They have a son, Samuel, who was born in 2001.